The school can offer Online Registration. This will allow for a link to be placed on the school’s website for New Student Registration. 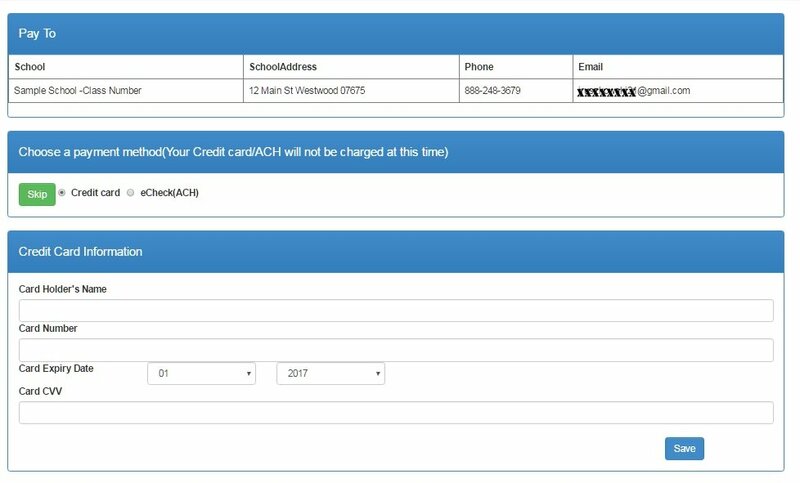 *The end result will also allow the parent to login to the membership portal for future class enrollment, adding a sibling student, viewing/paying invoices and updating contact information. For more information see Membership portal. They are still required to enter an accurate, distinct email address and a cell phone number. They must also agree to your terms and conditions to create an account. They will be sent via email and/or text message a verification code to confirm they are a person. Once the cell phone and verification number is entered. They will start the student registration. They can save a student and then enter a second one. 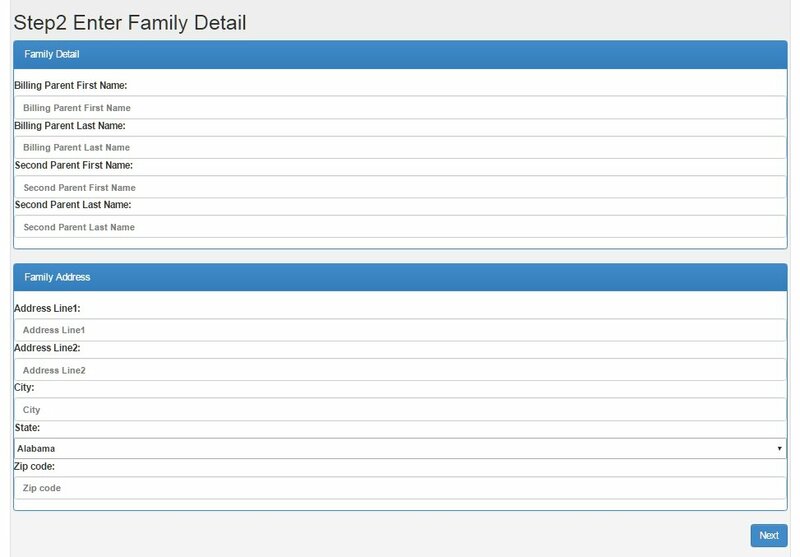 There is one set of family information for all students. The billing person is mandatory. Second parent is optional. This one address will be populated in all of the address fields. It can be edited by parent or studio if a student or parent lives in a different location or the family invoice should go elsewhere. The School can set up Questions to be asked. a drop down list to select how did they hear about the school to t-shirt sizes. Some studios ask for an Emergency contact if parents can not be reached. The Questions/answers are in the School Questions tab under the student. Open Enrollment for classes is the next section. The studio determines when to open the enrollment for a season by setting the School Season to Active. Only Classes that have the Status of Active will be offered for enrollment. If the class is full, the class will show, but not allow selection. 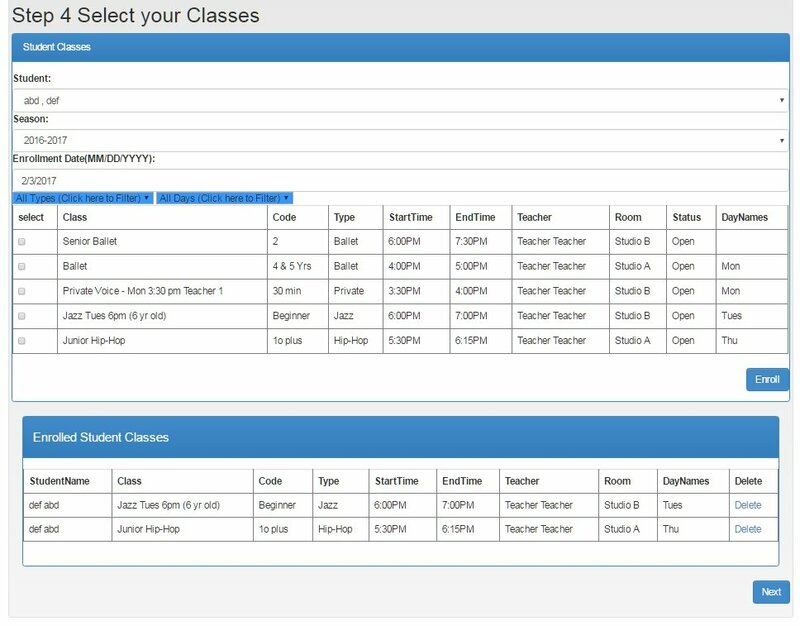 If the class has a status of Do Not Show, the class will not be listed and only the studio will be able to enroll in it. If the school has a payment processor account set up, The following screen will appear for a payment option to be stored on file in the processor’s vault (not CompuDance). A studio can allow the parent to be required to enter this payment information or they can have the option to Skip the payment account storage. See Gateway information. Once the registration is complete, the system will automatically send out a Welcome letter from the studio with their login and password. The school may customize this letter to direct the registrant as they wish. You will find this letter in Alert Types named SignUpPassword. If the school has a Pay at Signup Income category, it is created when the student registration is complete. The registrant can then log in to the portal to pay this invoice.See membership portal for more details. The school can also use the Student Online Register to see the enrollments. The students/parents have their own manual which can be found clicking here.